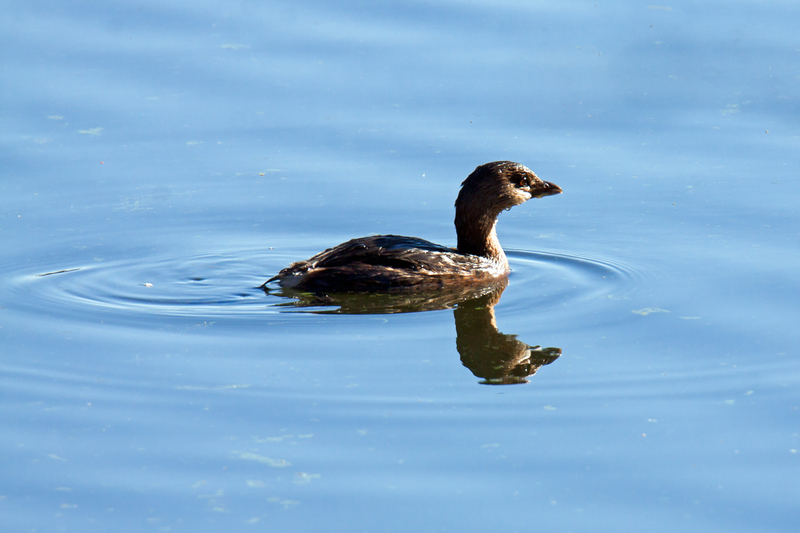 Although they behave like diving ducks, Pied-billed Grebes (Podilymbus podiceps) are members of an entirely different family and have small, distinctive bills that make them easy to identify. They tend to hang out in deeper water, are in constant motion, and are pretty small, which makes it a challenge to get a good shot of one. I spotted this grebe this past weekend at the same little suburban pond where I observed the Hooded Mergansers and Wood Duck that have been featured recently in recent blog posts. I haven’t yet seen grebes out of the water, but I am really curious now to get a look at their feet. Can ducks smile? 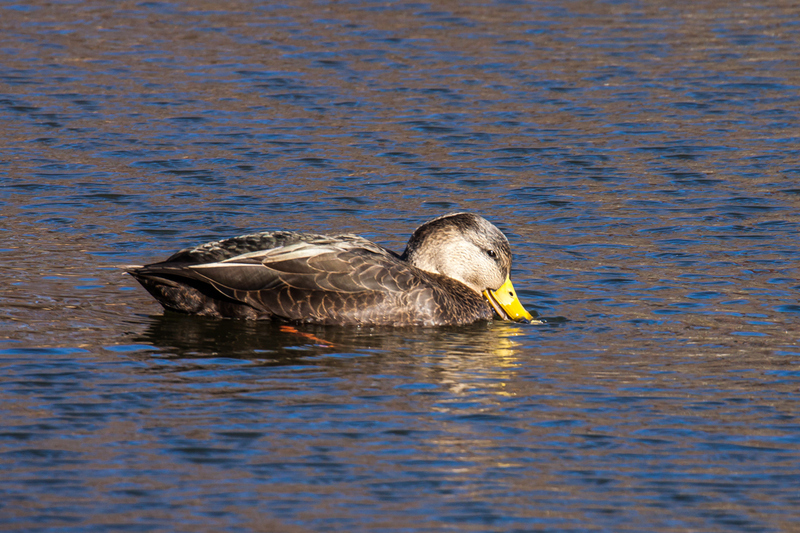 I realize that a duck’s bill is pretty inflexible, but I couldn’t help but think that this American Black Duck (Anas rubripes) was giving me a coy little smile as it dipped its bill into the water this past Monday at a small suburban pond in Kingstowne, Virginia.. When I first spotted two ducks swimming around together, I thought they were simply two female mallards. When I looked more closely at them, it seemed that their bills were brighter and more yellow than that of a a female mallard. 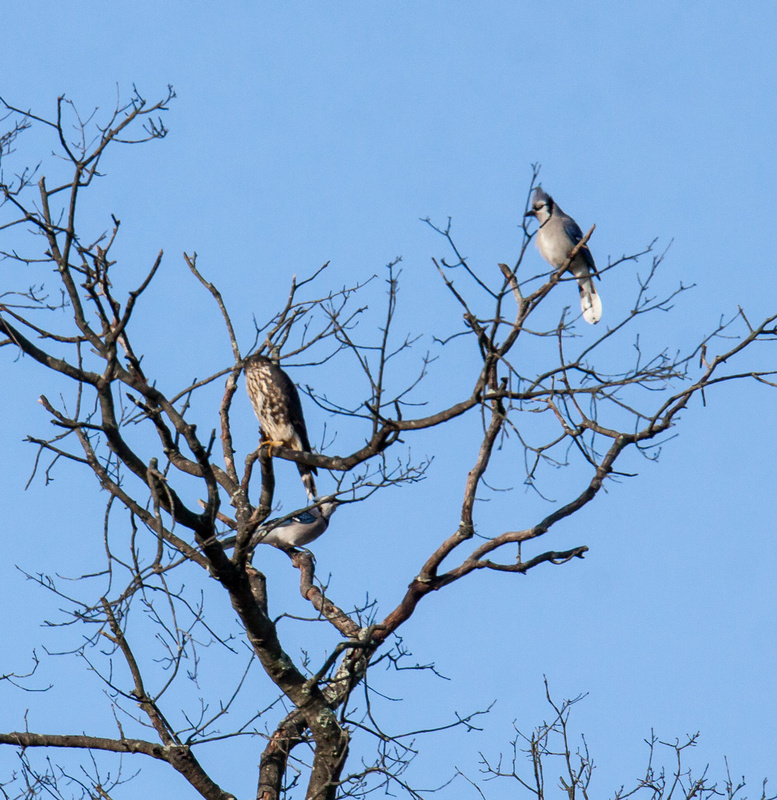 When I got home, I pulled out my birding guide and looked through the section on ducks. I concluded that the two ducks, one of which is shown in the photo, are American Black Ducks. 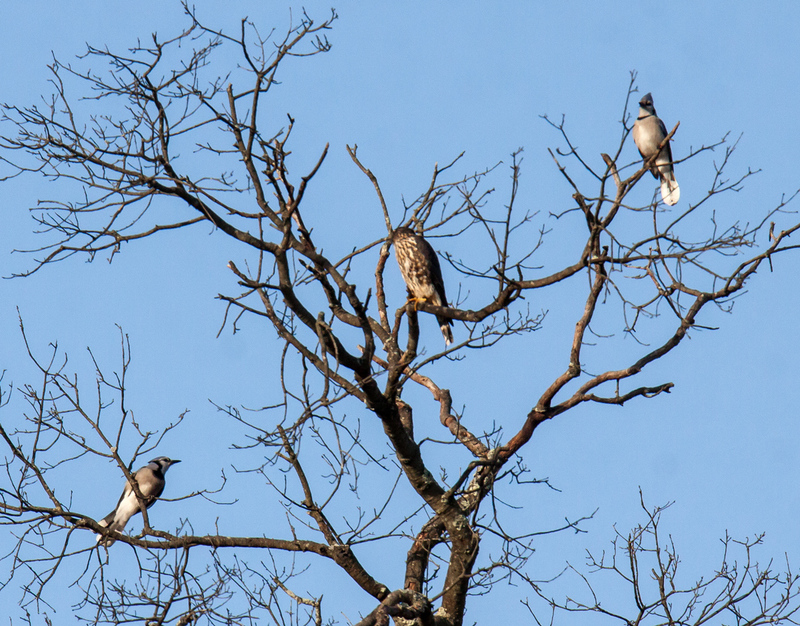 When I am really uncertain about a bird species, I will post it to a Facebook page on which more experienced birders provide help with identification. In this case, I decided to be bold and make this posting without confirmation of my identification. 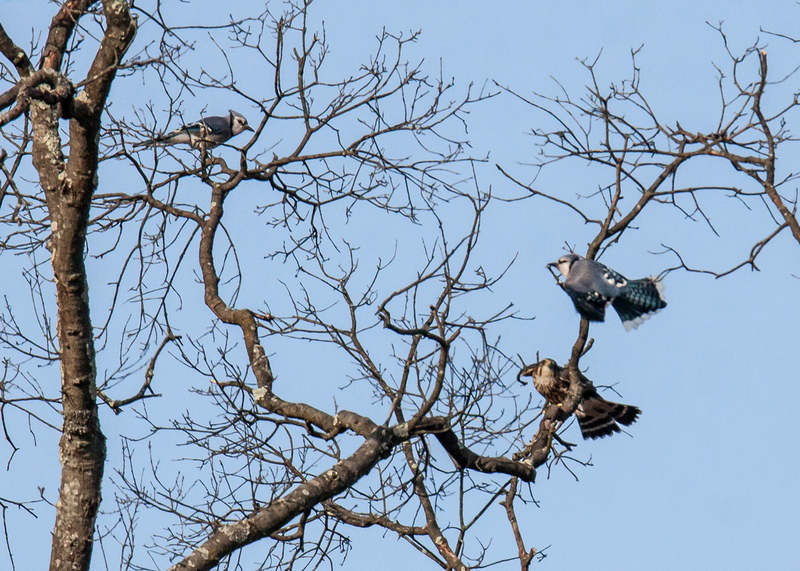 If I am incorrect, it won’t be the first time, and certainly not the last time—bird identification is not easy, with lots of variation caused by gender, season, age, and location. In the interests of gender equality, I decided to feature a handsome male Hooded Merganser duck (Lophodytes cucullatus) after spotlighting his beautiful female counterpart yesterday. 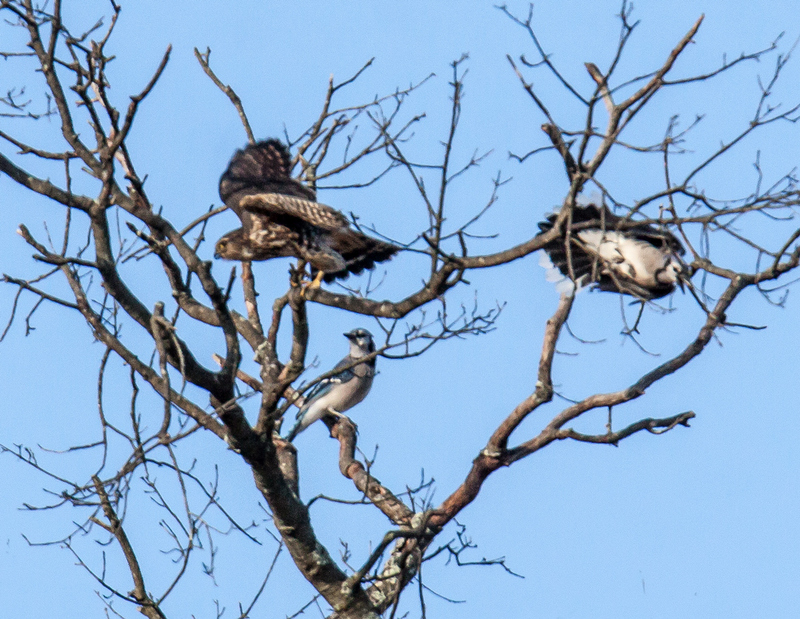 I captured this image yesterday afternoon at a small suburban pond in Kingstowne, a community about a mile or so from where I live. 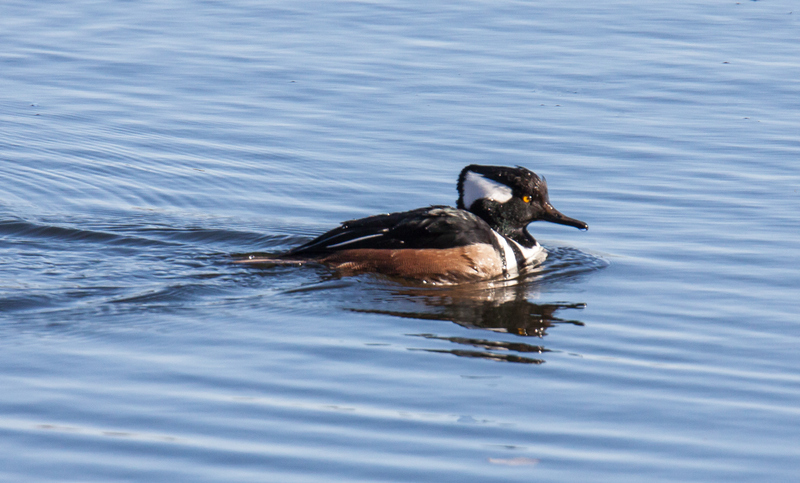 Hooded Merganser ducks are notoriously skittish and will usually fly away as soon as they sense my presence. The small group of “Hoodies” at this pond, however, react by swimming slowly away toward the center of the pond, where they are out of range of my long telephoto zoom lens. As a result, I have to react quickly whenever I am luck enough to catch one relatively close to the shore. 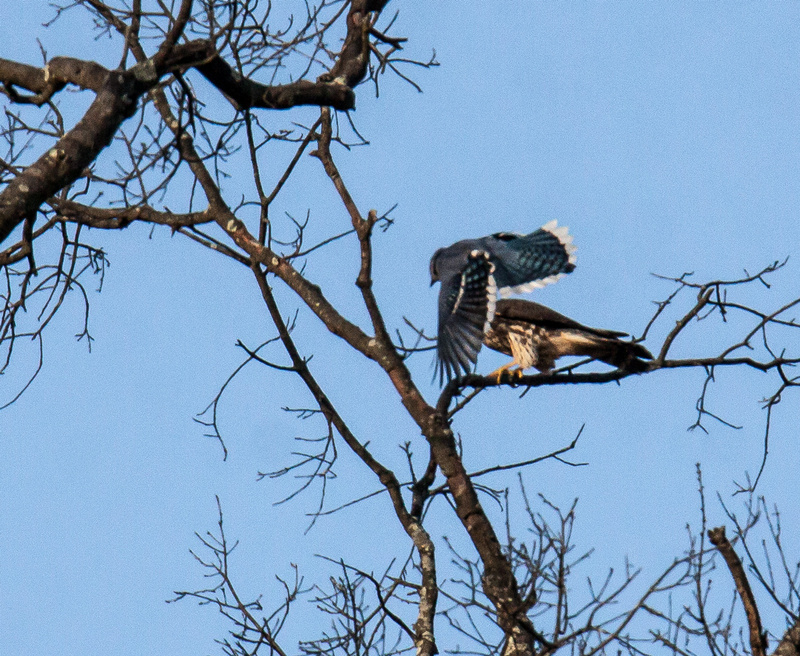 Having captured this image, I was faced with choices of how to crop it. Conventional wisdom dictates that a bird swimming to the right should be placed in the left side of the image. In this case, though, I really liked the V-shaped wake that the duck was leaving behind it, so I put the “Hoodie” just to the right of center. I encourage you to double-click on the image to see some of the details of this shot, like the drop of water on the tip of the duck’s bill. As I contemplate the image, I can’t help but think how much the water deserves equal billing as the primary subject. I love the wake in the rear, the ripples in the front, the ripples coming toward the viewer, and the beautiful reflections. 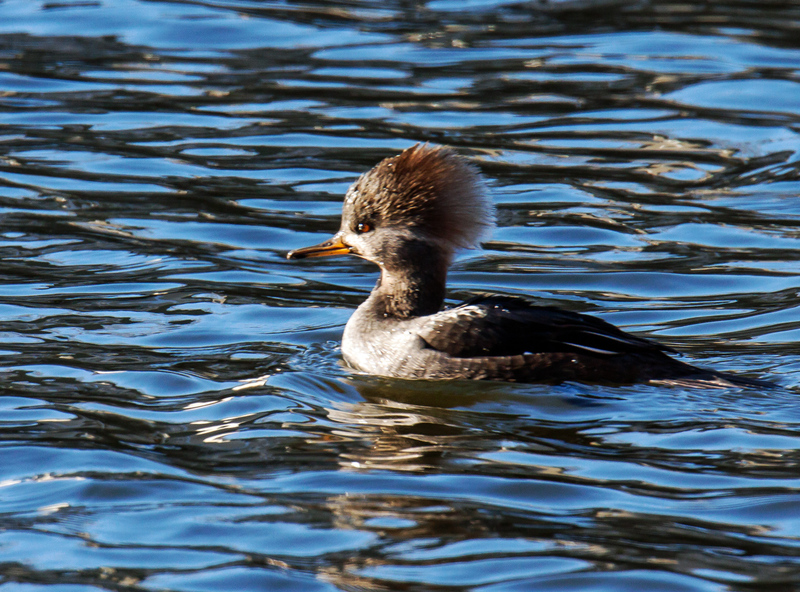 Hooded Mergansers (Lophodytes cucullatus) are among my favorite ducks, and I especially love the freaky hairstyle of the females, like this one that I spotted this past Friday at the a small pond in Kingstowne, a suburban community in Northern Virginia near where I live. 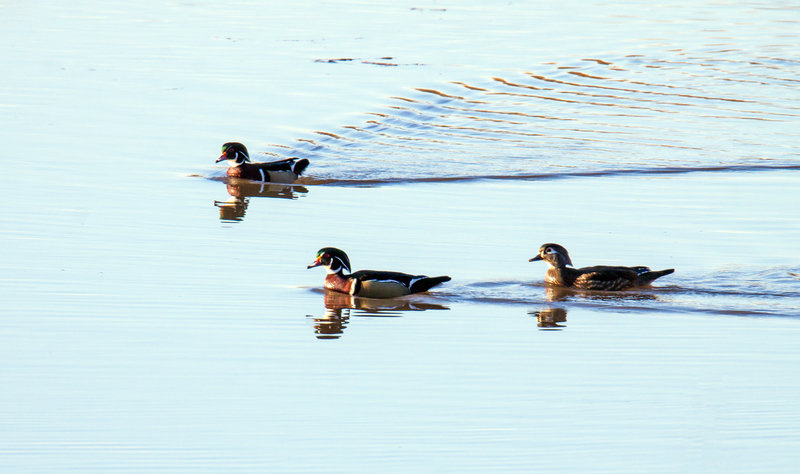 Three Wood Ducks (Aix sponsa) silently swam into view in the early morning light, their passage creating a trail of ripples in the still waters of the little creek. A sense of tranquility filled the air as another day slowly began. What was on your menu for Thanksgiving? 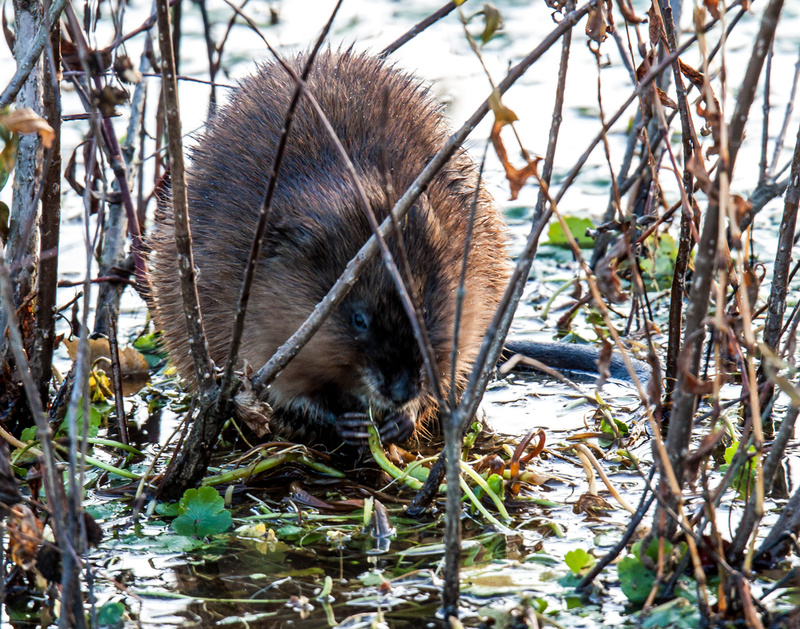 No, I did not dine on muskrat for Thanksgiving dinner, but early in the morning yesterday this little muskrat (Ondatra zibethicus) at Huntley Meadows Park decided to celebrate the holiday with some fresh greens. That was almost certainly a healthier meal than most of us consumed later in the day.